In this Part we’re going to return to the subject of callbacks. We’ll introduce another technique for writing callbacks in Twisted that uses generators. We’ll show how the technique works and contrast it with using “pure” Deferreds. Finally we’ll rewrite one of our poetry clients using this technique. But first let’s review how generators work so we can see why they are a candidate for creating callbacks. As you probably know, a Python generator is a “restartable function” that you create by using the yield expression in the body of your function. By doing so, the function becomes a “generator function” that returns an iterator you can use to run the function in a series of steps. Each cycle of the iterator restarts the function, which proceeds to execute until it reaches the next yield. Here we have a generator that creates the sequence 1, 2, 3. If you run the code, you will see the print statements in the generator interleaved with the print statement in the for loop as the loop cycles through the generator. The generator function doesn’t start running until “called” by the loop (using the next method). Once the generator is running, it keeps running until it “returns” to the loop (using yield). When the loop is running other code (like the print statement), the generator is not running. When the generator is running, the loop is not running (it’s “blocked” waiting for the generator). Once a generator yields control to the loop, an arbitrary amount of time may pass (and an arbitrary amount of other code may execute) until the generator runs again. This is very much like the way callbacks work in an asynchronous system. We can think of the while loop as the reactor, and the generator as a series of callbacks separated by yield statements, with the interesting fact that all the callbacks share the same local variable namespace, and the namespace persists from one callback to the next. Furthermore, you can have multiple generators active at once (see the example in inline-callbacks/gen-3.py), with their “callbacks” interleaved with each other, just as you can have independent asynchronous tasks running in a system like Twisted. Something is still missing, though. Callbacks aren’t just called by the reactor, they also receive information. When part of a deferred’s chain, a callback either receives a result, in the form of a single Python value, or an error, in the form of a Failure. In Python 2.5 and later versions, the yield statement is an expression that evaluates to a value. And the code that restarts the generator can determine that value using the send method instead of next (if you use next the value is None). What’s more, you can actually raise an arbitrary exception inside the generator using the throw method. How cool is that? Now when a series of callbacks is chained together in a deferred, each callback receives the result from the one prior. That’s easy enough to do with a generator — just send the value you got from the previous run of the generator (the value it yielded) the next time you restart it. But that also seems a bit silly. Since the generator computed the value to begin with, why bother sending it back? The generator could just save the value in a variable for the next time it’s needed. So what’s the point? Recall the fact we learned in Part 13, that the callbacks in a deferred can return deferreds themselves. And when that happens, the outer deferred is paused until the inner deferred fires, and then the next callback (or errback) in the outer deferred’s chain is called with the result (or failure) from the inner deferred. So imagine that our generator yields a deferred object instead of an ordinary Python value. The generator is now “paused”, and that’s automatic; generators always pause after every yield statement until they are explicitly restarted. So we can delay restarting the generator until the deferred fires, at which point we either send the value (if the deferred succeeds) or throw the exception (if the deferred fails). That would make our generator a genuine sequence of asynchronous callbacks and that’s the idea behind the inlineCallbacks function in twisted.internet.defer. 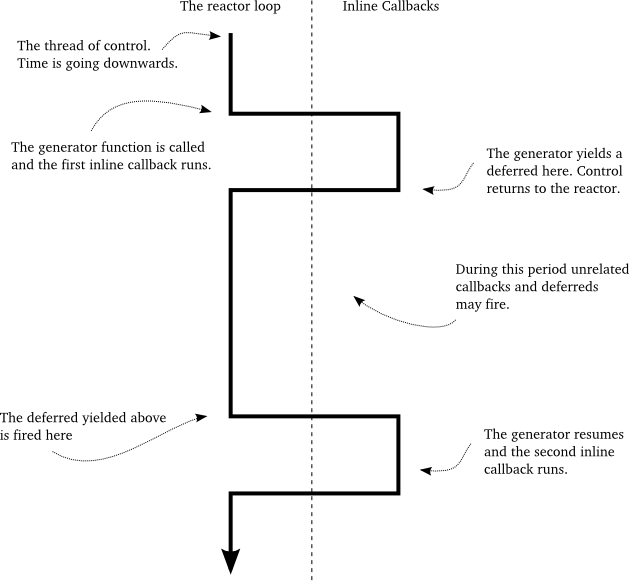 Run the example and you will see the generator execute to the end and then stop the reactor. The example illustrates several aspects of the inlineCallbacks function. First, inlineCallbacks is a decorator and it always decorates generator functions, i.e., functions that use yield. The whole purpose of inlineCallbacks is turn a generator into a series of asynchronous callbacks according to the scheme we outlined before. Second, when we invoke an inlineCallbacks-decorated function, we don’t need to call next or send or throw ourselves. The decorator takes care of those details for us and ensures the generator will run to the end (assuming it doesn’t raise an exception). Third, if we yield a non-deferred value from the generator, it is immediately restarted with that same value as the result of the yield. And finally, if we yield a deferred from the generator, it will not be restarted until that deferred fires. If the deferred succeeds, the result of the yield is just the result from the deferred. And if the deferred fails, the yield statement raises the exception. Note the exception is just an ordinary Exception object, rather than a Failure, and we can catch it with a try/except statement around the yield expression. In the example we are just using callLater to fire the deferreds after a short period of time. While that’s a handy way to put in a non-blocking delay into our callback chain, normally we would be yielding a deferred returned by some other asynchronous operation (i.e., get_poetry) invoked from our generator. Ok, now we know how an inlineCallbacks-decorated function runs, but what return value do you get if you actually call one? As you might have guessed, you get a deferred. Since we can’t know exactly when that generator will stop running (it might yield one or more deferreds), the decorated function itself is asynchronous and a deferred is the appropriate return value. Note the deferred that is returned isn’t one of the deferreds the generator may yield. Rather, it’s a deferred that fires only after the generator has completely finished (or throws an exception). If the generator throws an exception, the returned deferred will fire its errback chain with that exception wrapped in a Failure. But if we want the generator to return a normal value, we must “return” it using the defer.returnValue function. Like the ordinary return statement, it will also stop the generator (it actually raises a special exception). The inline-callbacks/inline-callbacks-2.py example illustrates both possibilities. In our new version the inlineCallbacks generator function get_transformed_poem is responsible for both fetching the poem and then applying the transformation (via the transform service). Since both operations are asynchronous, we yield a deferred each time and then (implicitly) wait for the result. As in client 6.0, if the transformation fails we just return the original poem. Notice we can use try/except statements to handle asynchronous errors inside the generator. Try turning off one or more of the servers to see how the client handles errors. Like the Deferred object, the inlineCallbacks function gives us a new way of organizing our asynchronous callbacks. And, as with deferreds, inlineCallbacks doesn’t change the rules of the game. Specifically, our callbacks still run one at a time, and they are still invoked by the reactor. We can confirm that fact in our usual way by printing out a traceback from an inline callback, as in the example script inline-callbacks/inline-callbacks-tb.py. Run that code and you will get a traceback with reactor.run() at the top, lots of helper functions in between, and our callback at the bottom. The same figure works in both cases because the idea being illustrated is the same — one asynchronous operation is waiting for another. Since the callbacks share a namespace, there is no need to pass extra state around. The callback order is easier to see, as they just execute from top to bottom. With no function declarations for individual callbacks and implicit flow-control, there is generally less typing. Errors are handled with the familiar try/except statement. The callbacks inside the generator cannot be invoked individually, which could make code re-use difficult. With a deferred, the code constructing the deferred is free to add arbitrary callbacks in an arbitrary order. The compact form of a generator can obscure the fact that an asynchronous callback is even involved. Despite its visually similar appearance to an ordinary sequential function, a generator behaves in a very different manner. The inlineCallbacks function is not a way to avoid learning the asynchronous programming model. As with any technique, practice will provide the experience necessary to make an informed choice. In this Part we learned about the inlineCallbacks decorator and how it allows us to express a sequence of asynchronous callbacks in the form of a Python generator. In Part 18 we will learn a technique for managing a set of “parallel” asynchronous operations. Why is the inlineCallbacks function plural? Study the implementation of inlineCallbacks and its helper function _inlineCallbacks. Ponder the phrase “the devil is in the details”. 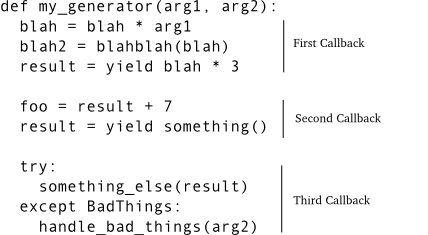 How many callbacks are contained in a generator with N yield statements, assuming it has no loops or if statements? Poetry client 7.0 might have three generators running at once. Conceptually, how many different ways might they be interleaved with one another? Considering the way they are invoked in the poetry client and the implementation of inlineCallbacks, how many ways do you think are actually possible? Move the got_poem callback in client 7.0 inside the generator. Then move the poem_done callback inside the generator. Be careful! Make sure to handle all the failure cases so the reactor gets shutdown no matter what. How does the resulting code compare to using a deferred to shutdown the reactor? A generator with yield statements inside a while loop can represent a conceptually infinite sequence. What does such a generator decorated with inlineCallbacks represent? could you give me some hints what is wrong here? Hi Pet, is the asynchronous function you are calling also stopping the reactor? You can only stop the reactor once. Check out client 8.0, which uses DeferredList to wait for multiple asynchronous calls to complete. I think that’s a cleaner solution. yes it stops reactor after its job is done, basically it downloads a page. Sometimes scripts download one page, sometimes more. So it is not possible to call async function which uses reactor twice, if it stops reactor? the reactor, only very top-level code needs to do that generally). after they are all done. That’s the idea you want, but it’s easier to express with a DeferredList (see client 8.0). to run Twisted in a separate thread, I believe that has been done before. Then your main thread can still be synchronous. There’s a typo in the Client 7.0 section. The first server invocation is missing an ‘s’ in transformedpoetry.py. it’s not an issue for the inlineCallbacks use case. 3) after that I increment necessary value by updating a collection in mongo db. So, is it possible that ‘my increment’ is earlier than ‘reset()’ block ? Hm, it’s hard to say. I guess this is pseudo-code, right? since it is doing multiple non-blocking operations. howcome some of your print keywords are pink and some of them are dark blue?